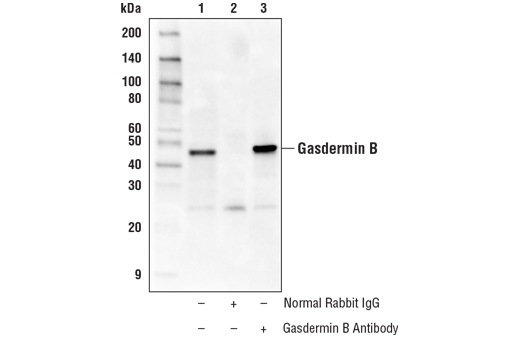 Gasdermin B Antibody recognizes endogenous levels of total Gasdermin B protein. Polyclonal antibodies are produced by immunizing animals with a synthetic peptide corresponding to residues surrounding Leu96 of human Gasdermin B protein. Antibodies are purified by protein A and peptide affinity chromatography. 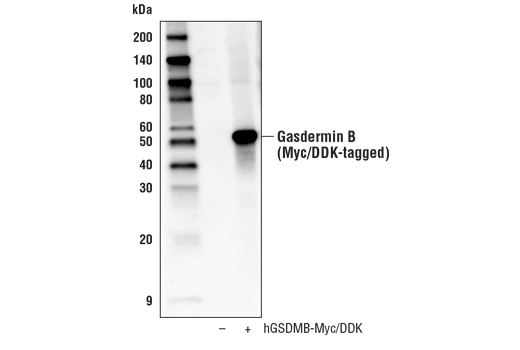 Western blot analysis of extracts from 293T cells, untransfected (-) or transfected with a construct expressing Myc/DDK-tagged full-length human Gasdermin B (hGSDMB-Myc/DDK; +), using Gasdermin B Antibody. Western blot analysis of extracts from various cell lines using Gasdermin B Antibody (upper) or β-Actin (D6A8) Rabbit mAb #8457 (lower). Immunoprecipitation of Gasdermin B from COLO 205 extracts. Lane 1 is 10% input, lane 2 is Normal Rabbit IgG #2729, and lane 3 Gasdermin B Antibody. 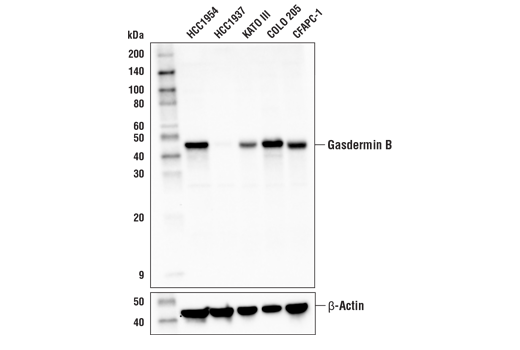 Western blot was performed using Gasdermin B Antibody. Mouse Anti-rabbit IgG (Conformation Specific) (L27A9) mAb (HRP Conjugate) #5127 was used as a secondary antibody. The gasdermin family that includes GSDMA, GSDMB, GSMDC, GSDMD, and GSDME have been shown to play a role in inflammation and cell death. Gasedermin D has been reported to have a critical role as a downstream effector of pyroptosis (1,2). Pyroptosis is a lytic type of cell death triggered by inflammasomes, multiprotein complexes assembled in response to pathogen-associated molecular patterns (PAMPs) or danger-associated molecular patterns (DAMPs) that result in the activation of caspase-1 and subsequent cleavage of pro-inflammatory cytokines IL-1β and IL-18 (3). Gasdermin D was identified by two independent groups as a substrate of inflammatory caspases, caspase-1 and caspase-11/4/5, producing two fragments: GSDMD-N and GSDMD-C. Cleavage results in release of an intramolecular inhibitory interaction between the N- and C-terminal domains, allowing the N-terminal fragment GSMDM-N to initiate pyroptosis through the formation of pores on the plasma membrane (4-7). Gasdermin B (GSDMB) has been reported to be upregulated in several tumor types, and in breast cancer has been associated with metastasis and poor prognosis (8,9). In addition Gasdermin B has been associated with immune disorders including asthma (10,11). Gasdermin B expression has also be found in the lung epithelium associated with asthma. Gasdermin B can also have a role in pyroptosis as it was found to activate caspase-4 and promote Gasdermin D cleavage (12). Kayagaki, N. et al. (2015) Nature 526, 666-71. Shi, J. et al. (2015) Nature 526, 660-5. Broz, P. and Dixit, V.M. (2016) Nat Rev Immunol 16, 407-20. Aglietti, R.A. et al. (2016) Proc Natl Acad Sci U S A 113, 7858-63. Ding, J. et al. (2016) Nature 535, 111-6. Liu, X. et al. (2016) Nature 535, 153-8. Sborgi, L. et al. (2016) EMBO J 35, 1766-78. Hergueta-Redondo, M. et al. (2014) PLoS One 9, e90099. Hergueta-Redondo, M. et al. (2016) Oncotarget 7, 56295-308. Yu, J. et al. (2011) Pediatr Pulmonol 46, 701-8. Das, S. et al. (2016) Proc Natl Acad Sci U S A 113, 13132-7. Chen, Q. et al. (2018) J Mol Cell Biol , in press.